Below is a viewpoint from Chapter 6 of the Foresight Africa 2017 report, which explores six overarching themes that provide opportunities for Africa to overcome its obstacles and spur inclusive growth. Read the full chapter on upholding good governance here. 2017 will be an important year for the advancement of democratic government in Africa. Several key elections will determine whether the region experiences democratic erosion or consolidation. As is shown Figure 6.2, on average, the region has made tremendous gains over the last 25 years. 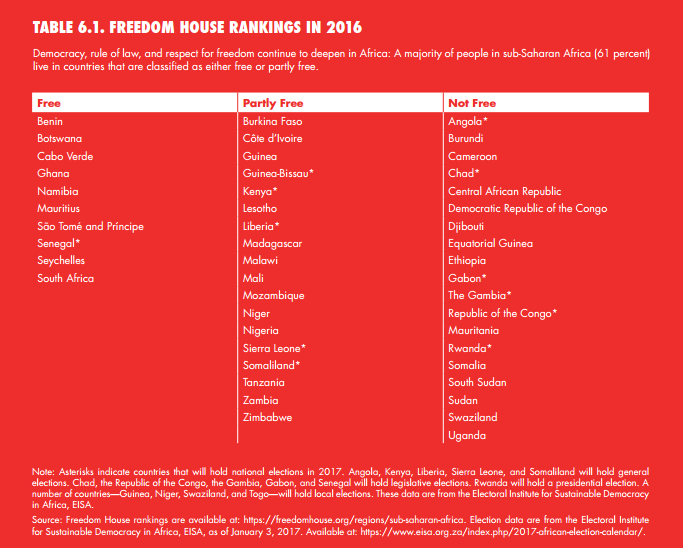 And according to Freedom House, in 2016, a majority of people in sub-Saharan Africa (61 percent) lived in countries that were classified as either free (12 percent) or partly free (49 percent). Among the countries classified as not free (39 percent of the population), the majority (65 percent) have a history of civil conflict; while the remaining proportion missed the political transitions that their regional peers went through beginning in the mid-1990s (see Table 6.1). In addition, only Djibouti has become not free due to a significant democratic erosion over the last 15 years. 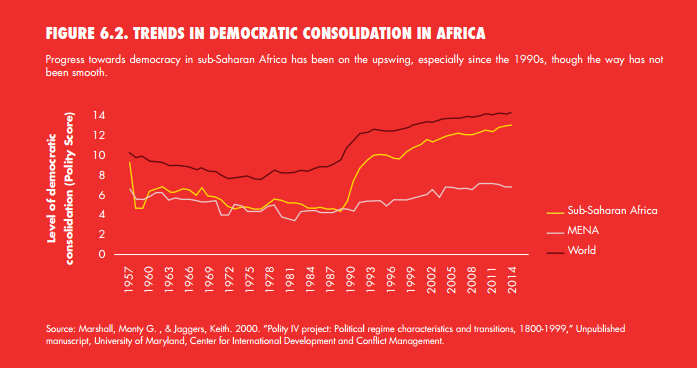 Simply stated, the general trend so far is one of sub-Saharan Africa as a region moving in fits and starts towards greater democratic consolidation. In 2017 the trend shown in Figure 6.2 is likely to hold. Several of the countries scheduled to hold elections will either improve their scores of democratic consolidation or hold steady. In other words, elections will continue to mirror the divergent trends in democratic consolidation in the region, but with greater gains for the regional score. For example, in Rwanda and Angola, post-conflict incumbent presidents will seek to consolidate their hold onto power, having done away with term limits. But a different set of post-conflict states—Sierra Leone and Liberia—will have open contests as the current incumbent presidents will be term-limited. In Kenya and Senegal, competitive general and legislative elections, respectively, will likely lead to greater levels of intra-elite political accountability and democratic consolidation. Due to the high stakes involved, there is the likelihood that elections in Kenya, Liberia, and Sierra Leone will be marred by violence. In Kenya, the key hotspots will likely be at the sub-national level—especially in the gubernatorial elections. Liberia and Sierra Leone are both weak post-conflict states that will face the normal challenges of holding elections under weakly institutionalized systems of electoral management. Lastly, in Chad, the Gambia, and the Republic of the Congo, elections will serve the purpose of consolidating autocratic rule. In the countries not holding elections in 2017, government effectiveness in providing public goods and services and horizontal accountability (through legislatures and courts) will be crucial for continued democratic consolidation. Government failure may precipitate protests that will likely be met by state repression, thereby eroding the values of accountable democratic government. Yet another challenge to democracy in 2017 will be insecurity (either due to urban crime, terror attacks, or insurgencies) and the extent to which elected governments in the region will be willing to use insecurity as a reason for curtailing freedoms of speech and movement in the region. In this regard, the regional forecast of 4.5 percent growth (by the African Development Bank) suggests that anticipated positive economic outcomes may obviate the need among the more autocratic African governments to revert to coercion, as opposed to good performance, as a way of staying in office. K. Ochieng’ Opalo, “African Elections: Two Divergent Trends,” Journal of Democracy, Vol. 23, No. 3 pp. 80-93 (2012). African Development Bank. African Economic Outlook. 2016. https://www.afdb.org/fileadmin/uploads/afdb/Documents/Publications/AEO_2016_Report_Full_English.pdf.